Death Valley National Park, on the California/Nevada border, is well known for encompassing the Badwater area. At 282 feet below sea level, Badwater is the lowest point in North America. Death Valley is also known for its extreme summer heat, when daytime temperatures can reach 120°F, and its extremely dry climate. 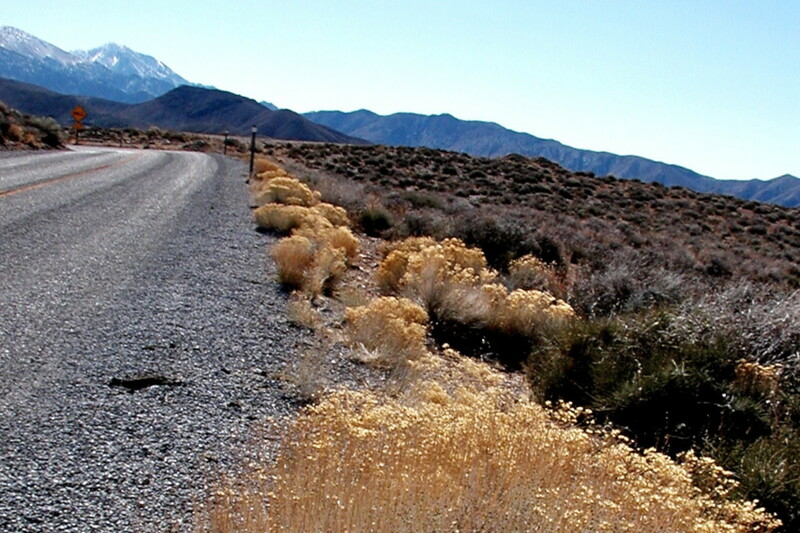 However, there is much more to Death Valley National Park for those who are interested in exploring its diversity. Visit in the winter months for pleasant temperatures and sunny days, and explore the badlands with ever-changing colors, see the snow-capped mountains, and enjoy the wildflower bloom. Below, I will discuss RV camping in Death Valley National Park and share photographs of some of the highlights of this most fascinating place. RV camping in Death Valley in the pleasant winter months is a wonderful way to enjoy the park. Since Death Valley has an average rainfall of less than 2" annually, you can usually expect sunny weather and comfortable temperatures in the winter months. RV camping in the Death Valley National Park campgrounds is low cost and allows you to be within easy driving distance of the most interesting points in the park. Of the nine campgrounds in Death Valley National Park, six are suitable for RV camping. While they do not have RV hookups, generator use is allowed in all but the Texas Springs campground. (A great place for tenting and for those RVers who would like a quieter setting. Most campgrounds have drinking water available, restrooms with flush toilets and a dump station. Furnace Creek Campground is the only one that will accept reservations. (Call 1-877-444-6777). There is a 14 day limit at Furnace Creek Campground. Other Death Valley National Park campgrounds have a 30 day limit. All the other National Park campgrounds are on a first come, first served basis. You can check the National Park Recreation data base for updated information on particular parks. Do check at the National Park Visitor Center for up-to-date camping information! Prices listed are eligible for the America the Beautiful Senior Discount. Sunset Campground: Open Oct-Apr. Elevation 196 below sea level. 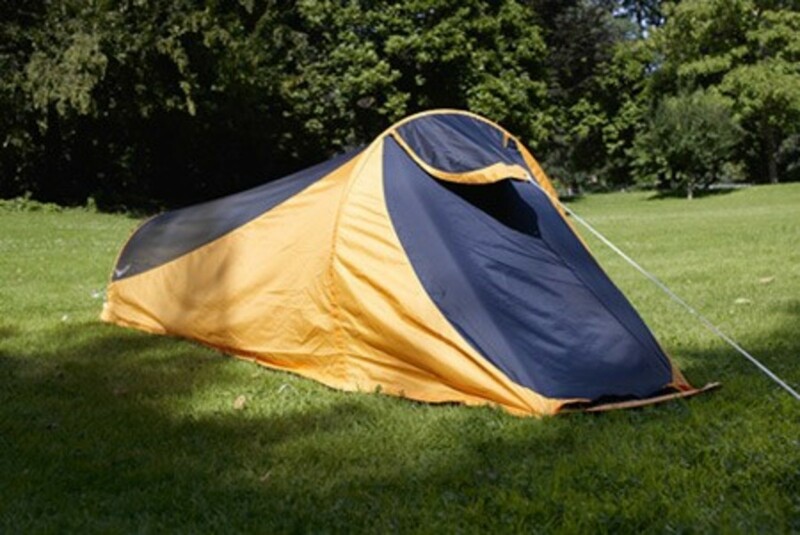 Suitable any size RVs or tents. $12. Texas Spring Campground: Open Oct-Apr. Elevation is at sea level. Limited number of RV sites. No generators allowed. $14. 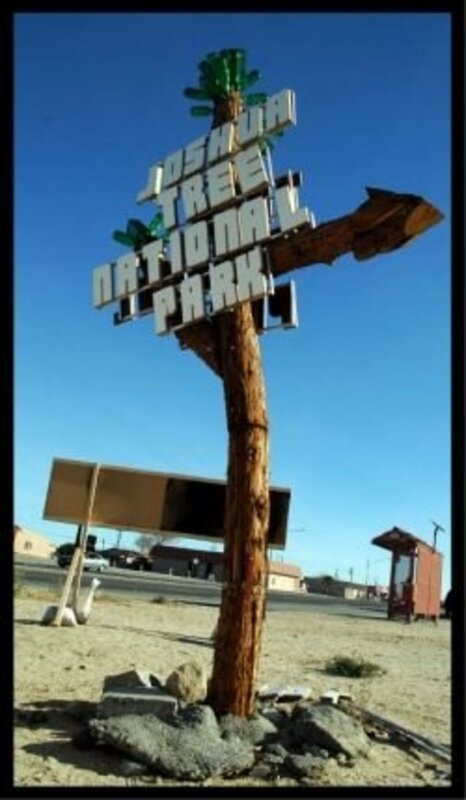 Stovepipe Wells Campground: Open Oct-Apr. Elevation is at sea level. 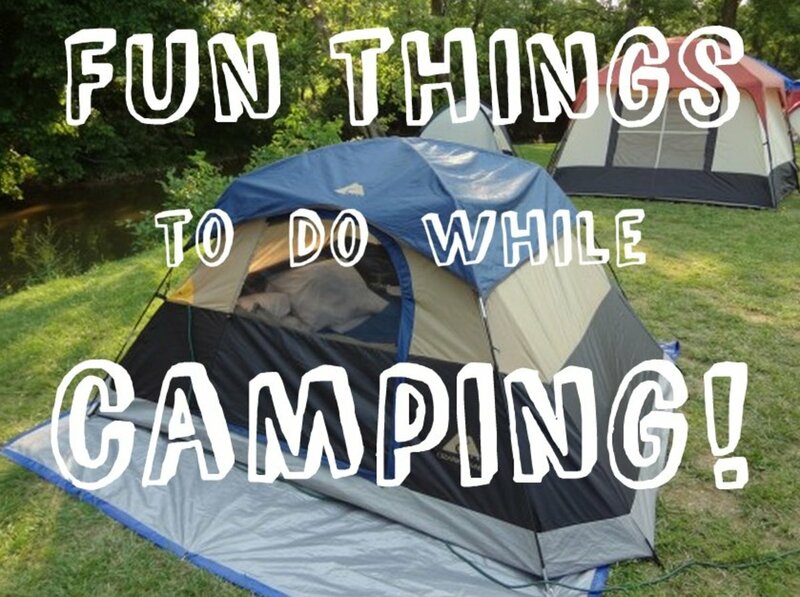 RV and tent sites. $12. Mesquite Spring Campground: Open all year. Elevation 1800 ft. RV and tent sites. $12. Wildrose Campground: Open all year. Elevation 4100 ft. No drinking water. RV and tent sites. Free. We stayed at Sunset Campground during our visit to Death Valley. 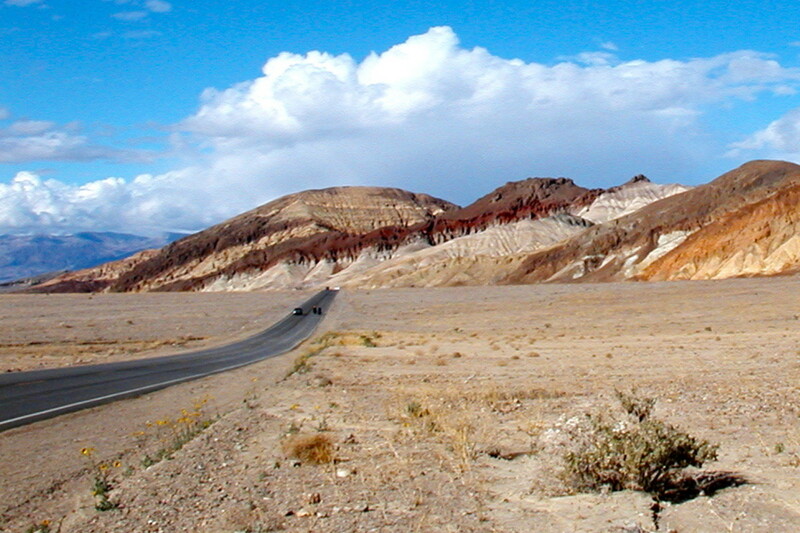 It is basically a huge flat parking area, but it is convenient to visit many of the sights in the Furnace Creek area. It was also easy to do day trips to almost any of the other areas of the park. 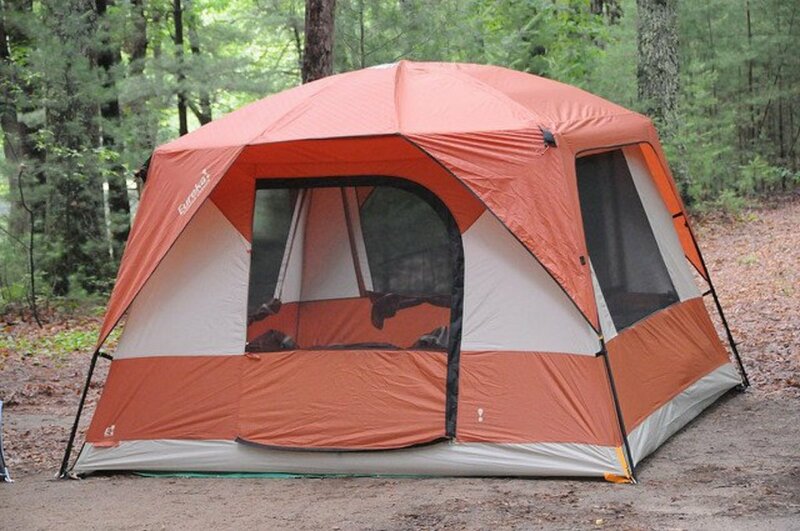 There are three other National Park campgrounds that are suitable for tents and may require high-clearance vehicles to access. If you want to camp where there are RV hookups, there is one concession-run campground in Death Valley: Stovepipe Wells RV Park. There is also a private RV park, Panamint Springs Resort, that has full hookups. These two privately run campgrounds can fill up during the busy season, so be sure to check for availability before heading out. 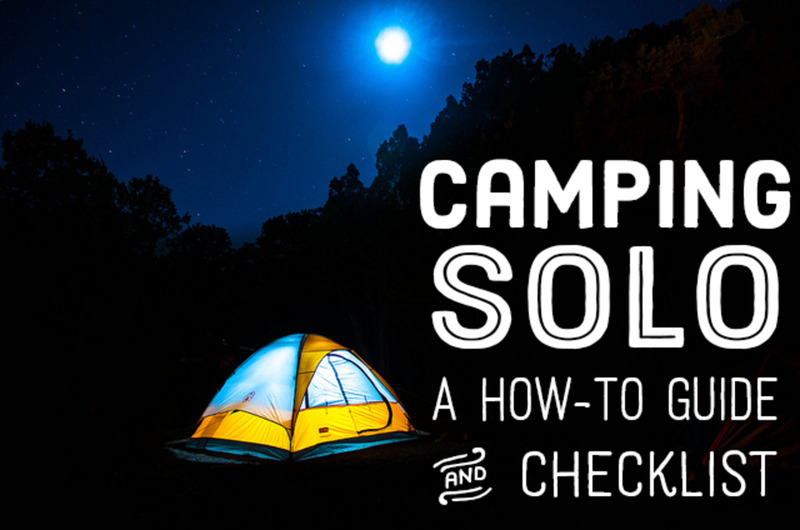 Plan ahead before heading out from your campground or hotel on a day trip! Death Valley is a wonderful place to explore and there are many interesting day trips to do once you have settled on a campground to serve as your base. Be forewarned that there are only a few places to get gas and food, so be sure to start out with a full tank of gas, and pack a picnic lunch, snacks and plenty to drink before starting out. When you are planning to RV camp at Death Valley, be sure to bring groceries and staples to last through your stay as there are only limited groceries available in the park. Gas is available at Furnace Creek, Stovepipe Wells, Furnace Creek, Beatty, Nevada and Tonopah, Nevada. Scotty’s Castle does sell snacks and sandwiches, but not gas. In 1996 there were 40 days when the temperature was 120°. In the summer of 2001 there were 154 days with temperatures over 100°. The highest ground temperature recorded at Furnace Creek on July 15, 1972 was 201° with a maximum air temperature of 128° that day. In 1953, no rainfall was recorded at the Greenland Ranch weather station. 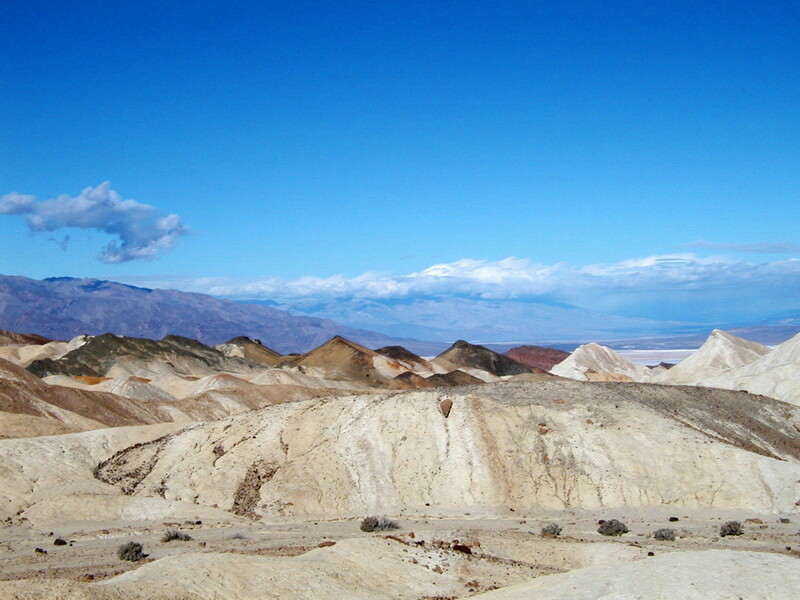 The name "Death Valley" was given to the area by a group of pioneers who became lost and thought they would die there. When they were rescued and led to safety, the story goes that one of them said, "Goodbye, Death Valley." The name stuck. 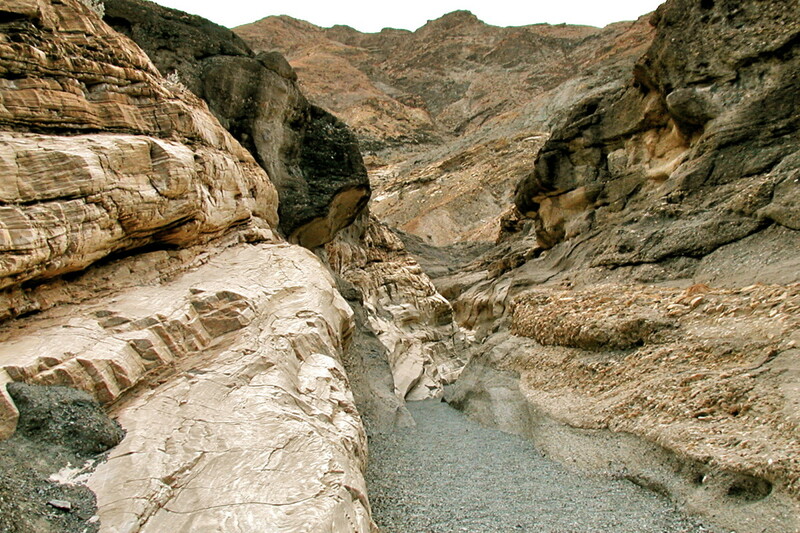 Enjoy this picture gallery and virtual tour of Death Valley's beauty and history. Late afternoon sun brings out the beautiful colors along Artist’s Drive. 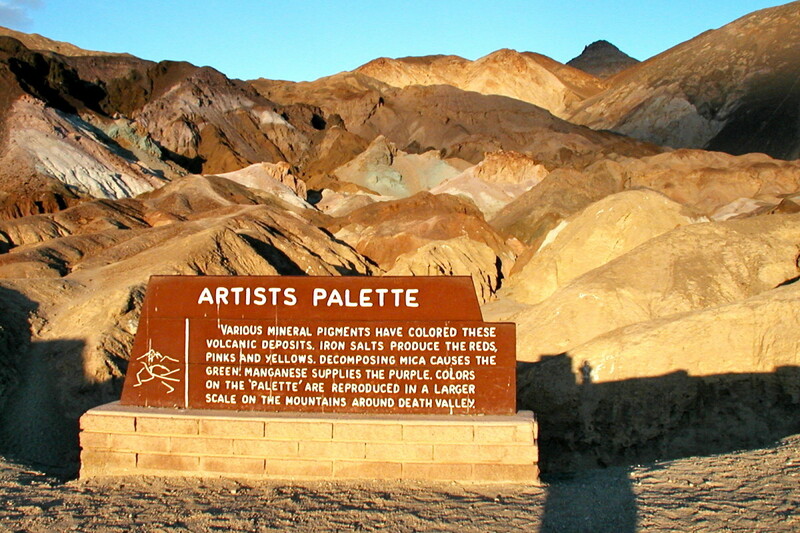 At the parking area, we stop to admire the view of Artist’s Palette. 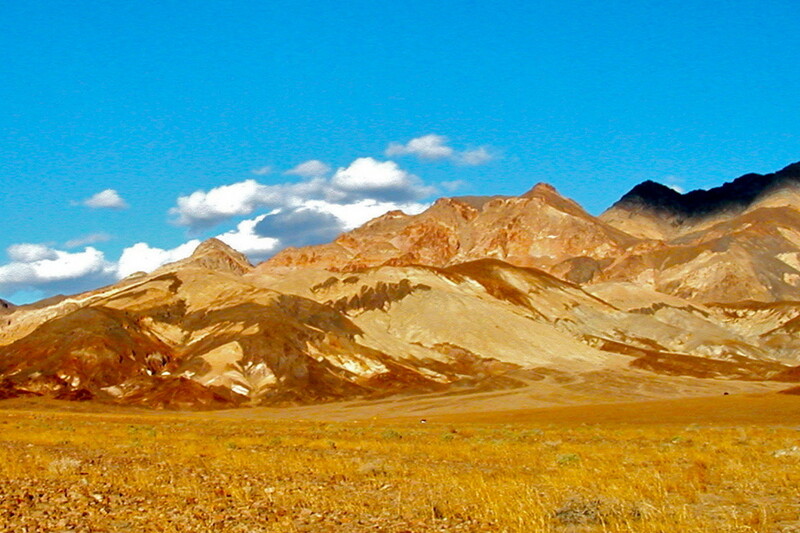 Here many colored pigments from volcanic deposits, iron salts and mica have painted the hills in a rainbow of colors. I snap many photographs as the changing light and shadows bring out different colors. When we got home, it’s hard to believe that these views are real…but they are! As the sun goes down, we continue on the drive, stopping occasionally to get out of the Jeep and admire the nearby hills as well as the distant views of snow-capped mountains. 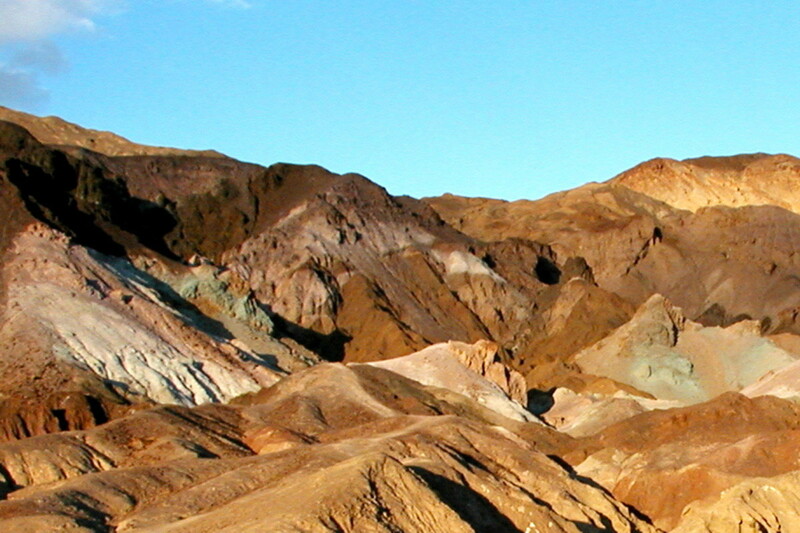 Located in the Furnace Creek area, Zabriskie Point is a maze of eroded badlands. Here is one of the most famous views in Death Valley. The colors are astonishing, particularly at sunset and sunrise when the angled sunlight lights up the colors. There is a parking area and the viewpoint is only a short walk up the hill. Be sure to wear closed-toe shoes for this walk, as loose gravel can make walking in sandals or flip flops uncomfortable. 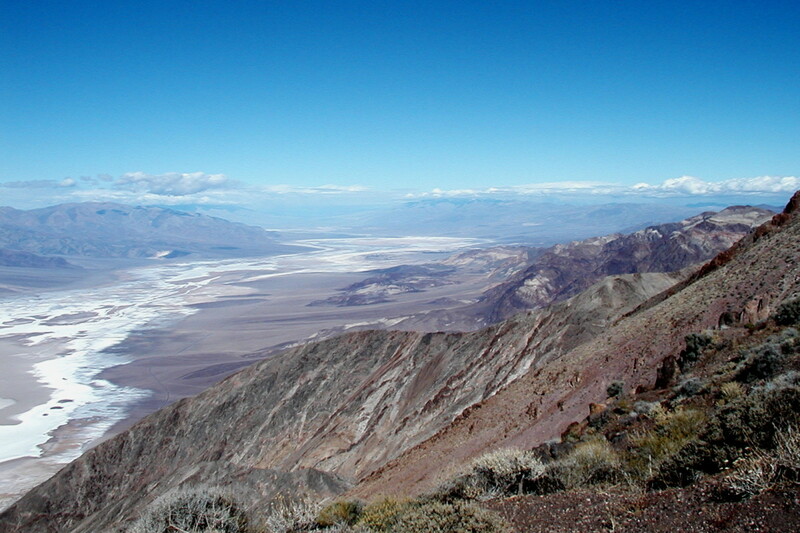 Typical of the diversity of Death Valley National Park, Dante’s view is one of the high points of the park at 5,000 feet above the valley. 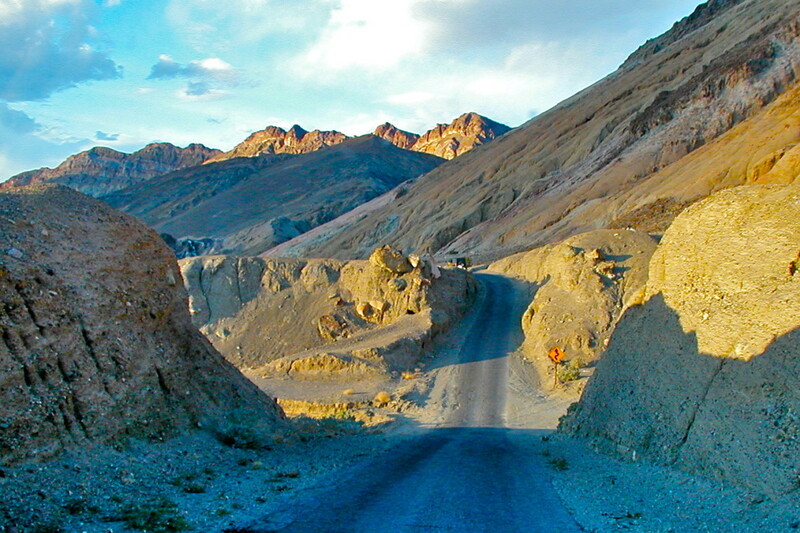 The winding road to the top of the mountain leads to a spectacular view of Death Valley. Don’t try this in your RV as the road has hairpin turns and is only open to vehicles less than 25 ft. in length. 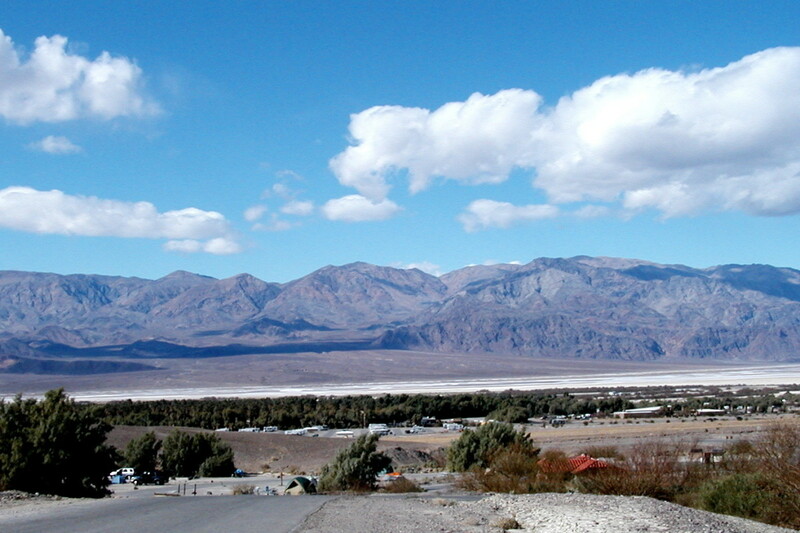 In the distance, you can see the Panamint Mountains towering above the valley, often with snowy caps. The highest mountain in Death Valley, Telescope Peak, rises 11,049 feet above the lowest point in the park, creating yet another dramatic contrast in Death Valley. 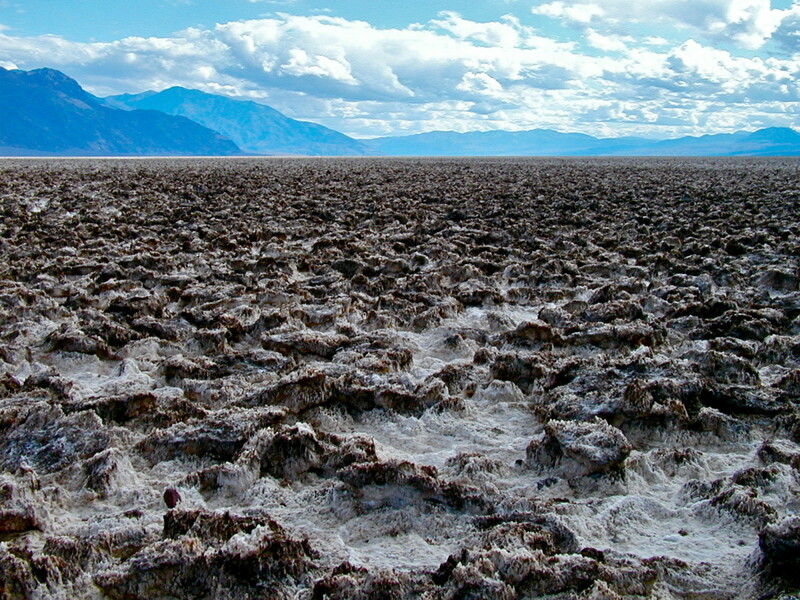 Badwater is the lowest point in North America, 282 feet below sea level. Here the summer air temperatures will rise to 120°F and above while the ground temperature on the salt flats can be much higher. When there are heavy rainstorms, a temporary lake might form on the salt flats, but it will disappear quickly. 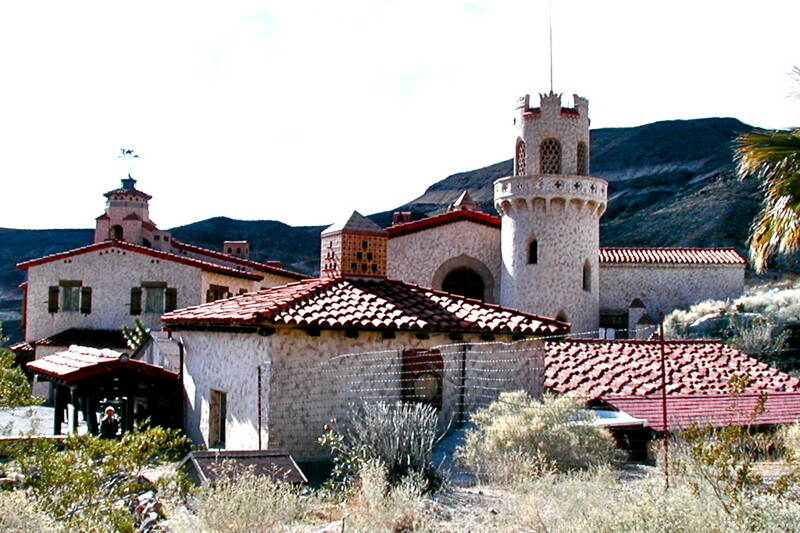 This beautiful Spanish-style mansion is named after prospector, Walter Scott, “Death Valley Scotty,” who claimed that he built the castle from gold from secret gold mines. Actually, it was built by his friend, Albert Mussey Johnson, as a vacation home during the 1920’s. Tours of the castle are available for a fee of $11-15 per person for adults. Pass-holder and children’s fees are lower. You must take a tour in order to see the inside of the house. 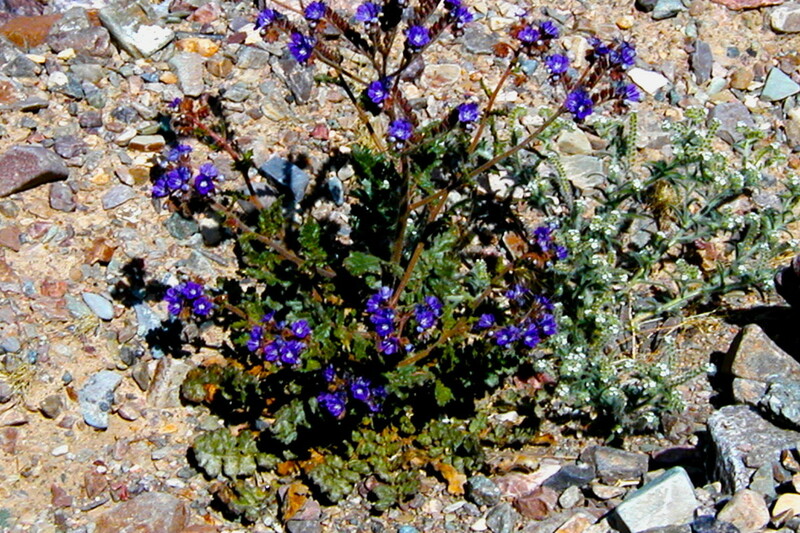 There are over 1000 different kinds of plants growing in Death Valley and 50 of them are endemic, unique to Death Valley. Occasionally, the winter rains will be heavier than normal, creating the right conditions for a spectacular wildflower bloom. This happened in 1996 and 2005. 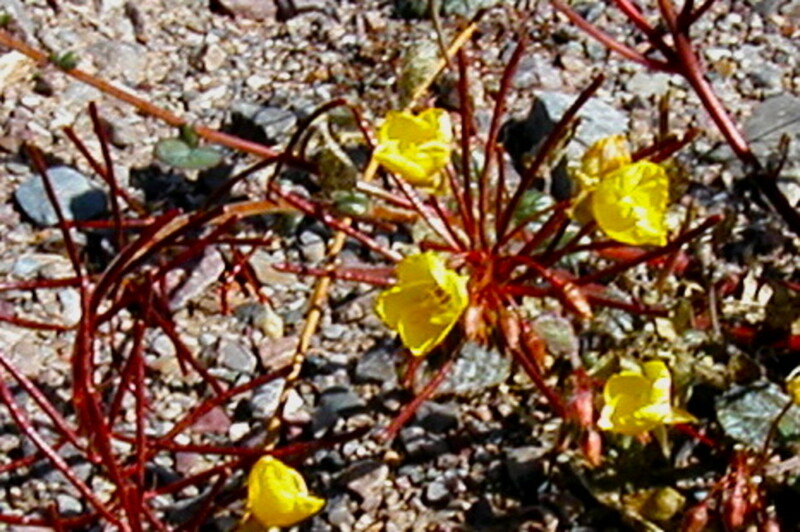 Even in average years, the months of February and March will bring out wildflowers in the desert, along the roadsides and nestled among the stones and rocks. We happened to be there when wildflowers were just starting to bloom, and enjoyed finding them in unexpected places. 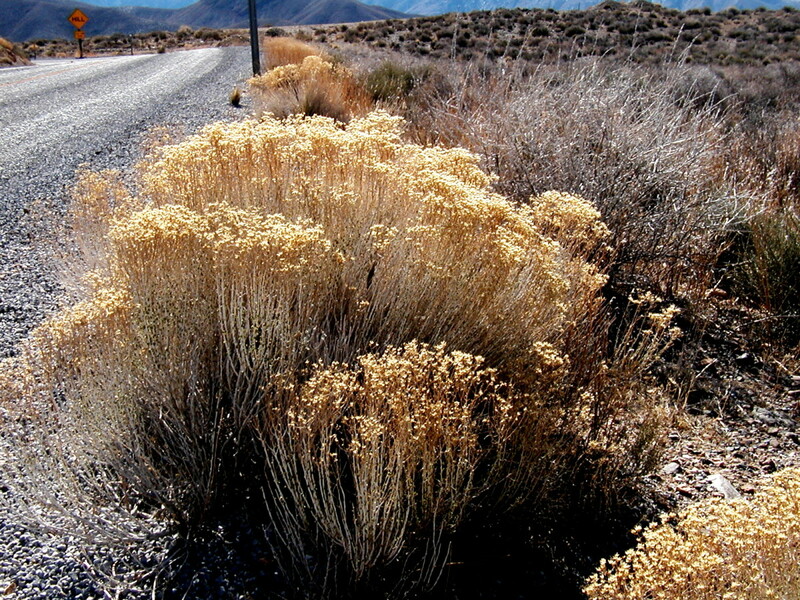 Many of the flowers are very tiny, and can easily be overlooked if you are driving. Do get out and walk some of the trails, but be careful where you step! 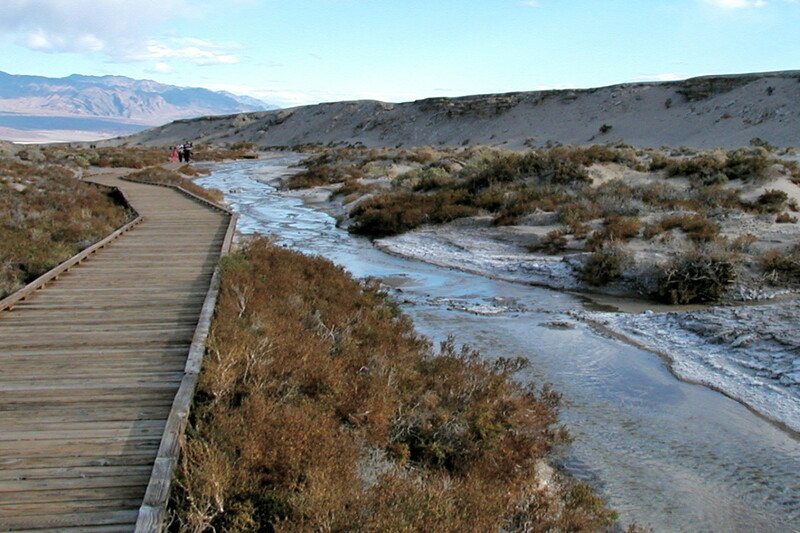 Borax was found in Furnace Creek (previously named Greenland) in 1881. The Harmony Borax Works was built by William t. Coleman. There, in 1884, the borax ore was processed by a workforce of 40 men who produced 3 tons of borax every day. 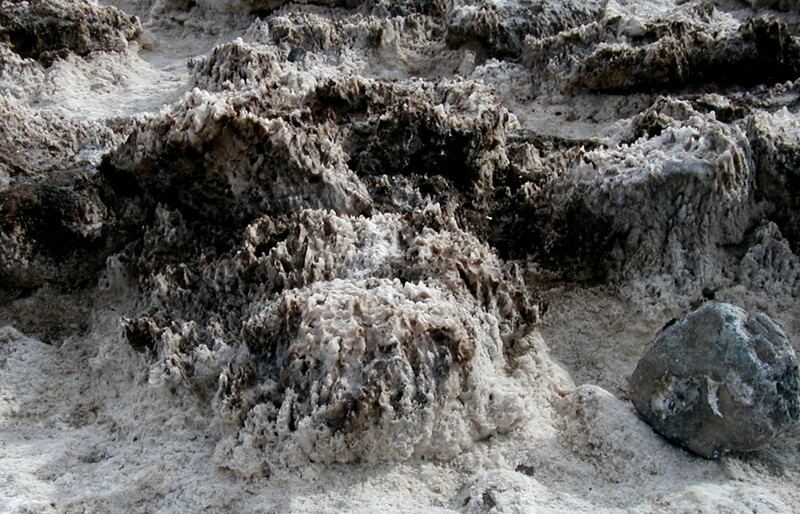 However, the summer temperatures were so hot, the processing water would not cool enough to allow the borax crystals to form, and the plant was eventually moved out of the valley. The most daunting task was getting the borax out of Death Valley and through the Mojave desert by wagons pulled by mule teams. This is how the 20-mule team borax became the famous symbol of the borax industry. 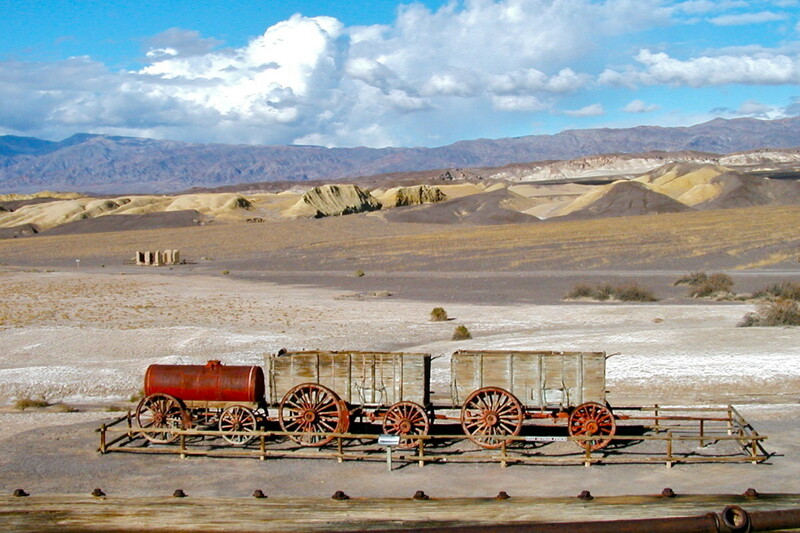 Today the remains of the Harmony Borax works still stand and visitors to Death Valley can see the wagons and parts of the plant at the original town site which has been placed on the Register of Historic Places. 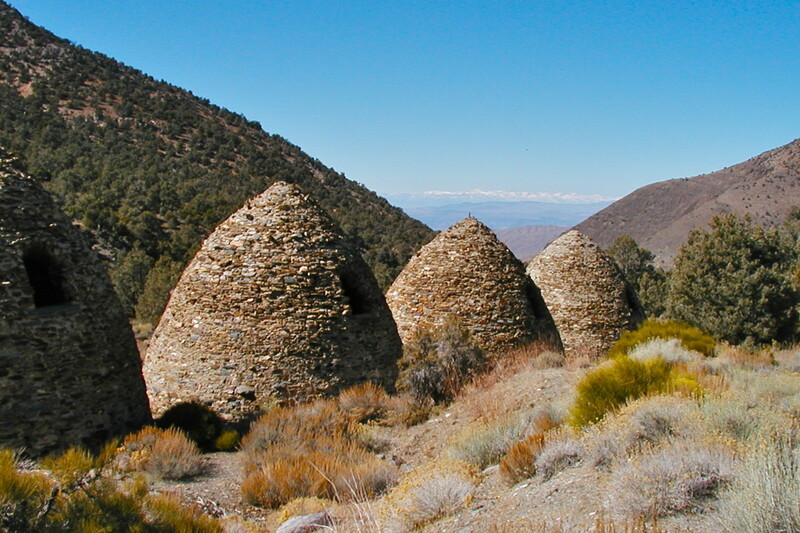 The beehive shape of the well-preserved charcoal kilns is a unique sight. The 25 ft. high kilns were buildt to produce charcoal used in the processing of lead and silver from nearby mines. It is believed that the kilns were only in operation for a short time before another source of fuel was found. Although the actual settlement, if there was one, has disappeared, the ten charcoal kilns stand in perfect condition. Table lists average monthly temperatures and average yearly rainfall in Death Valley National Park. Sunset Campground is a National Park Campground with no facilities. I hope you've enjoyed this virtual tour of some of the amazing sights at Death Valley National Park. When you are able to camp here with your RV and visit in person, you will find many more beautiful and exciting places to see and explore. Have You Been to Death Valley? What was your experience at Death Valley? I visited there, and I loved it! I visited Death Valley, but hated it! I have not visited, but would like to go sometime. I will plan on camping at Death Valley- it sounds wonderful! I'll visit someday, but will stay in a nice hotel instead of camping. Have You Enjoyed Your Virtual Visit? Please Leave a Comment! We have always owned our own RV, so do not have experience with RV rental agencies. Perhaps you can find some good feedback on RV review sites? We see a lot of Cruise America rentals on the road, but don't have any recommendations. Have a wonderful time on your US tour! We've been to Death Valley several times and have always enjoyed the beautiful scenery and diversity of the park. Hi Stephanie, we are planning our first RV hire and trip in the USA and would love to visit Death Valley, this early Nov for 12 to 14 days. We had a camper van until quite recently and would often go for long European trips (up 3 months) so are fully into full-time RV cruising. We are getting snowed under with info regarding the reliability of RV hire companies and would greatly appreciate any words of wisdom from yourself or any other skyaboveus contributor. Love you article which has really wetted our appetite.. Sounds wonderful. Thanks for all the useful information. This year we're going to do a East Coat Loop up to VA and back down for a few months. Got the motorhome ready, but I just had one minor knee surgery, and I need another bigger one on my shoulder. Imagine me hooking up and unhooking across country with one functioning arm! LOL! Hoping, AGAIN to head out after my my new shoulder. An aging camper is a sad thing to watch sometimes, but at least I dress well for my travels! LOL! fpherk48 - Well, I'm just fine, Paula! Our country's national parks are all so beautiful. We love visiting them, and I love to feature them on my hubs. This week, admission is free for National Parks. It's a great opportunity to visit one. Thanks for your comments -- it's always great to hear from you! Paul Kuehn - Thanks for your comments, Paul. If you visit Las Vegas again, Death Valley is about a 2 hour drive from there. It's a long day trip, but there is a lot you could see. 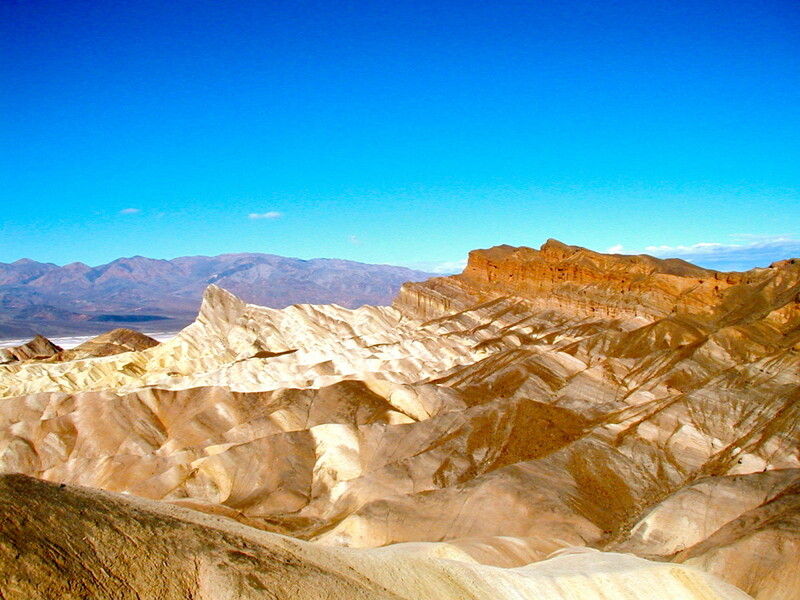 Death Valley is about 120 miles long, with many outstanding features to see. I hope you are able to visit someday. Stephanie, what a beautiful place. Wonderful job with this hub. I love the names; Furnace Creek, Stovepipe Wells, Dante's View, Devils Golf Course. Will have to add this to my list of places to get to. Love the photos. Hi Stephanie! This is an absolutely fantastic hub with great accompanying pictures. The closest I have been to Death Valley is Las Vegas and that was in 2000 and 2001. Out of curiosity, what is the average distance across Death Valley? I can appreciate how hot Death Valley is during the summer because the average temperatures in Udonthani in northeastern Thailand where I now live have been 106/85 during the past week and it is only the middle of April here! It would really be nice to tour Death Valley when I am in the southwestern part of the U.S. again now that I have your guide. I am sharing this hub with HP followers and on Facebook. 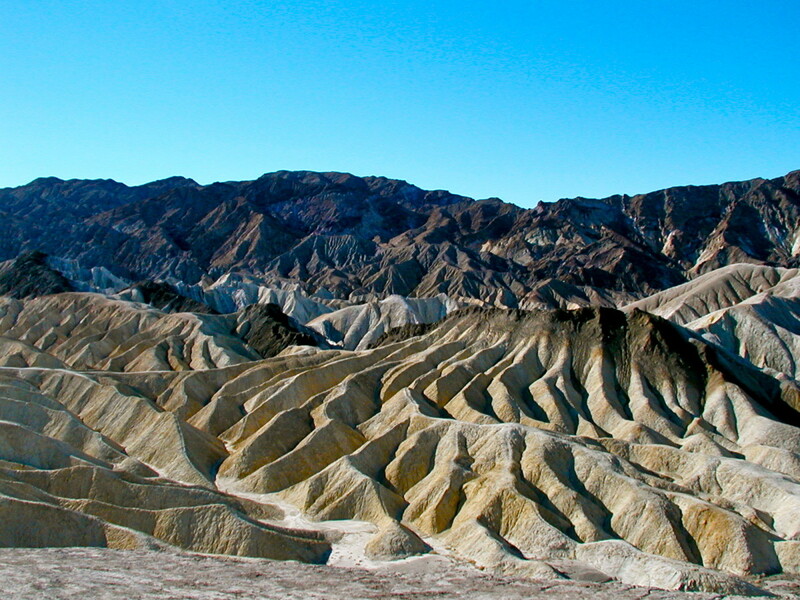 Availiasvision - Zabriski's point is one of my favorite places in Death Valley National Park. It's particularly beautiful at sunset when the late afternoon light enhances the colors of the rocks. Yes, I did add picture dividers to my hub using the photo capsure. Hubpages doesn't necessarily approve of this, but I like to use dividers sometimes, and I've kept them in this hub. I'm glad you like them. 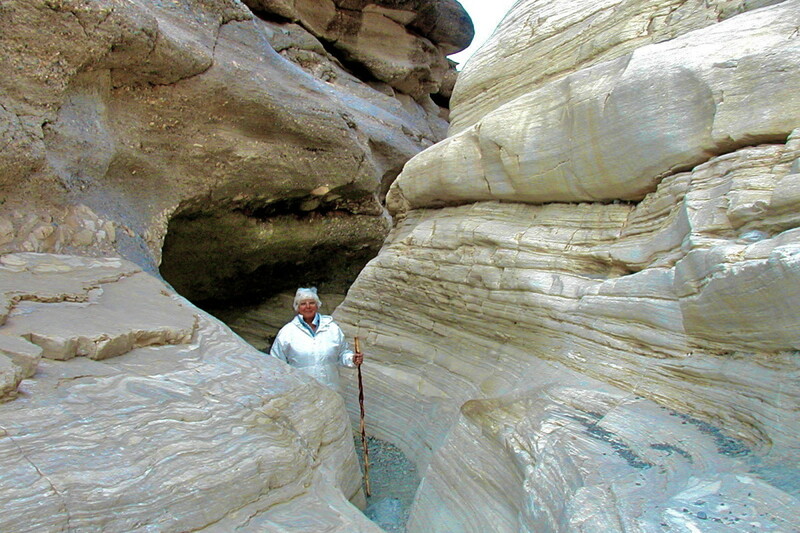 Marcy Goodfleisch - There is so much to see in Death Valley National Park, it's certainly worth a trip. 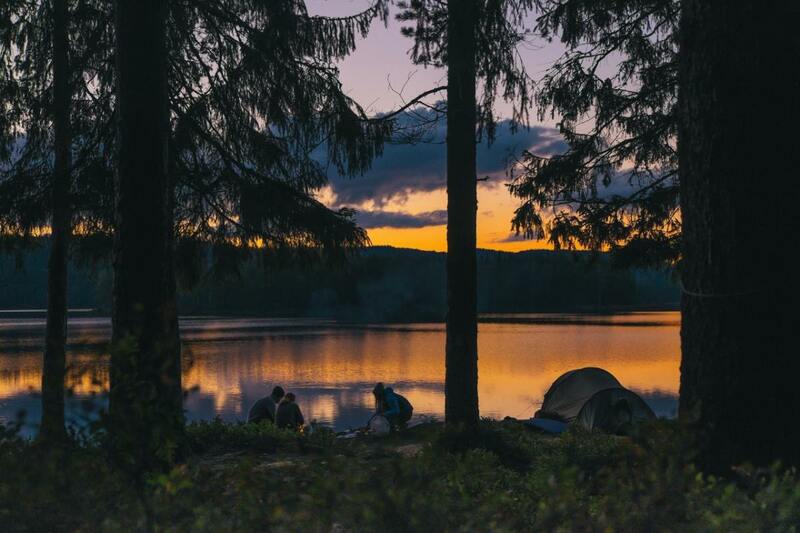 If you are camping, plan to go in the cooler months for a more enjoyable experience. Temperatures in the late spring, summer and fall can be quite hot! Have fun! What a lovely group of pictures. Death Valley is somewhere I would really like to see. I would especially like to see Scotty's castle and Zabriski's point. Your pictures of Zabriski's picked up the beautiful colors in the rocks. They look painted. The boardwalk also looks like a lot of fun. I noticed that you added colorful dividers to your hubs. How did you do that? As a "picture?" It looks really cool. Oh gosh - Steph, I've never thought of camping in Death Valley - I've always thought it was a bit too hazardous a terrain and climate! I've camped in Big Bend, though, and I can see that Death Valley would offer the same stark beauty and great experience. If done the right way, of course! Thanks so much for your comments, Audrey! As I look at my past photos of Death Valley National Park, I know I want to return, too. It is certainly a unique and beautiful place. Great Hub. My wife and I have crossed to the West Coast twice over the years, and I am trying to put together a plan for another trip this Summer/Winter/Summer. We would love to make Death Valley a part of our trip, but right now, I am dealing with some problems with our old Winnie and getting it up to snuff for such a trip. Oh my, Stephanie - this hub is absolutely spectacular! I've driven through parts of death valley several times not knowing about the National Park. I'll be sure to take a trip to this area again. Wonderful! Will do plenty of sharing. Aesta1 - Death Valley National Park is a unique and beautiful place, and well worth a visit. I'm glad that you enjoyed my photographs and the article. Thanks for stopping in to read and comment! These pictures are awesome. Anyone planning to visit there will definitely find these information useful. I felt I have visited the place after reading this. Joel Diffendarfer - Thanks so much for your kind words. Nothing could be more sad than kids growing up without knowing the joys of the great outdoors. I believe that our National Parks are one of the best ways to experience the vast and diverse beauty of nature. 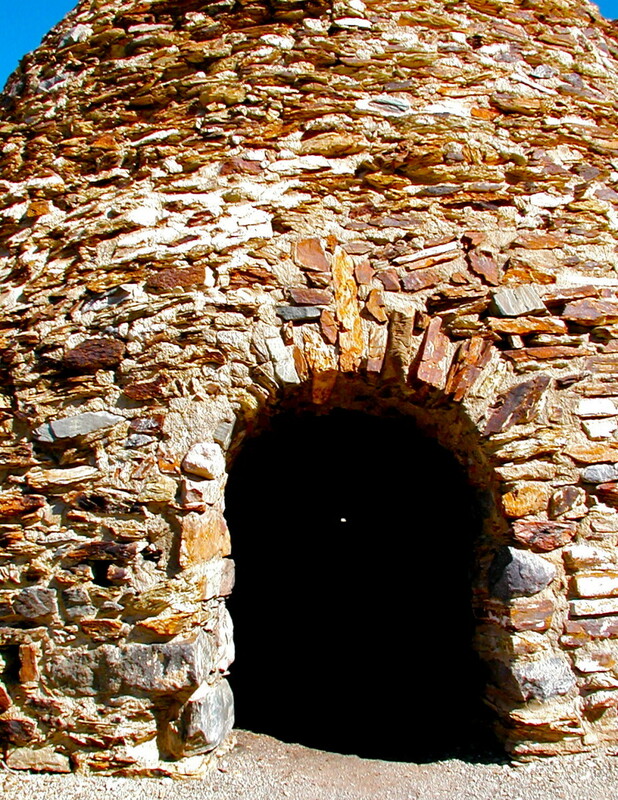 Death Valley National Park has an amazing history, too. I do appreciate your comments! Now this, like many of your hubs...IS...what I want my kids and grand kids to know...Can you imagine a junior high school or high school "class", that consisted of your hubs, would be like... The hope and lives it would change...Great Work...Art, History, Math, all combined. Love it! 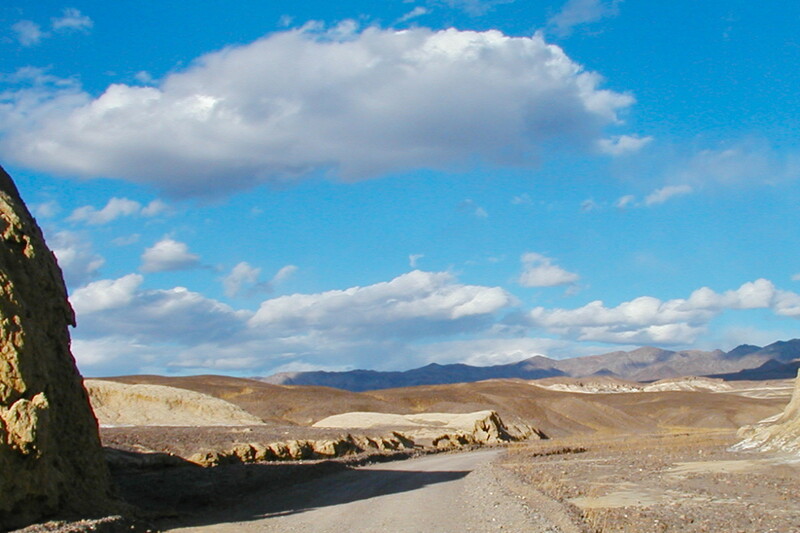 Thoughtforce - Many think of Death Valley as a barren wasteland, but it is really a most beautiful place. Thank you for visiting my hub and taking a virtual tour. I hope someday you will see it in person. Wonderful photos! I would love to go there one day but for now I enjoy the virtual tour. 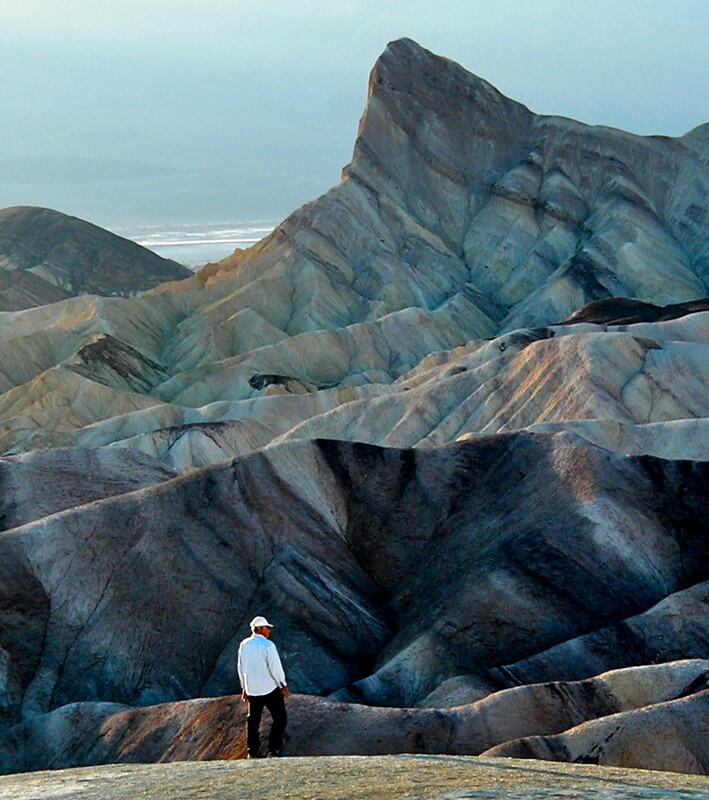 This hub is stunning and so beautiful, you have captured the beauty in Death Valley. 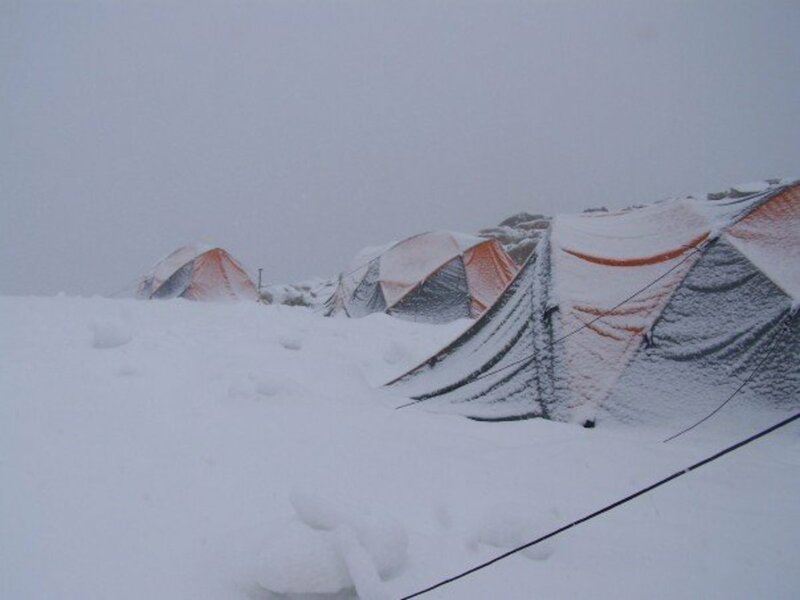 It must be an experience to camp in such a place. I just linked this great hub to my newest one showcasing the 8 national parks in California. Thought that you might wish to know. Mperrottet - Death Valley National Park is certainly worth the trip! It's a huge park with many different terrains, beautiful colors and stunning views. 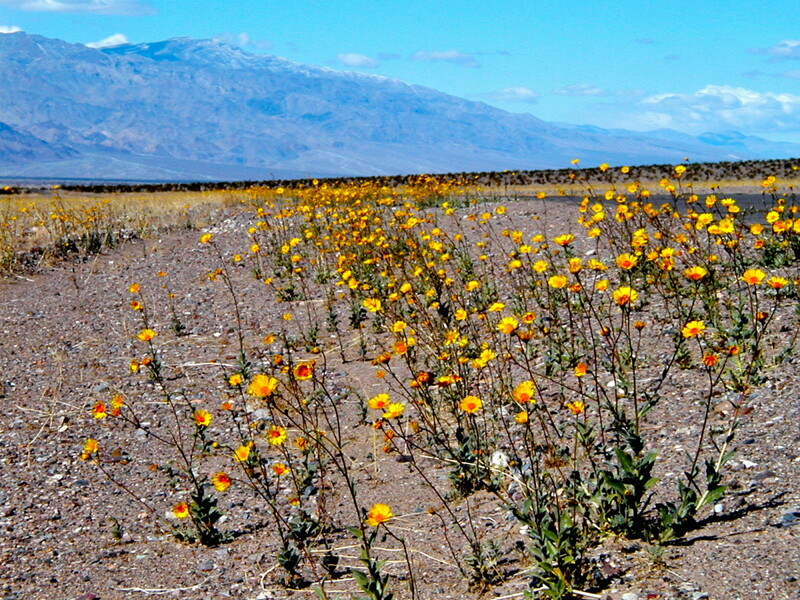 If you go in March, you have a good chance of seeing wildflowers in bloom, too. You can check the NP website to track to blooming times. Thanks so much for stopping to view my hub and photographs. Wishing you a wonderful trip! I'm planning another cross country trip for hopefully 2014, and this is one of the places we're going to see. We're going to try to go in March so that we can see the flowers. Great hub - I love the pictures! Voted up, useful, interesting, beautiful and awesome! Alocsin - RV camping in National Parks is one way to bring some of the comforts of life along with you, but, since we camped without electric hookups, we did not have air conditioning or heat unless we ran our generator. Luckily, the winter months are very comfortable, and we were fine without either one. Thanks for your comment and votes! Your hub and photos make me want to go out there. And it looks like RV camping avoids the heat and inconvenience. Voting this Up and Useful. Leahlefler - I'm so glad you enjoyed my photographs of Death Valley National Park! The many different mineral deposits can add many colors to the rock formations there. Sometimes it's hard to capture colors because of the bright sun. I found that colors show up better when photographed in early morning or late afternoon. It was great having you along on this virtual adventure! Thanks for your comments! What a fantastic hub! 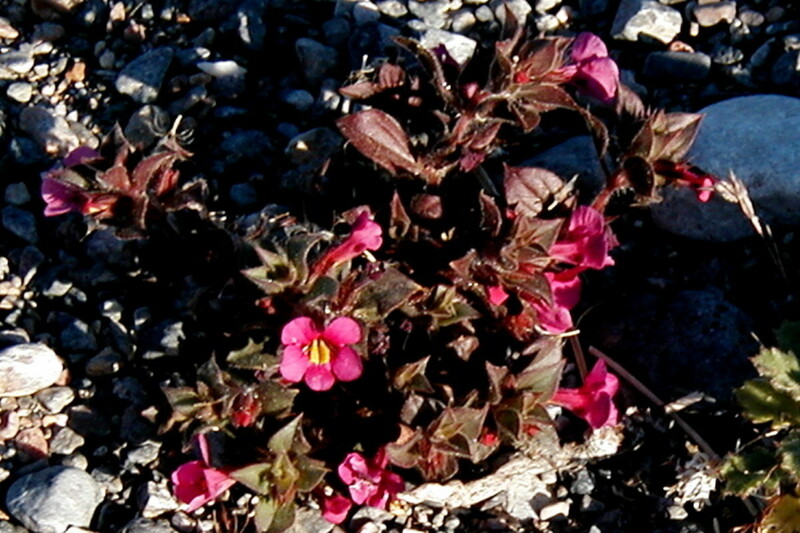 I love your pictures - I didn't realize how colorful Death Valley could be! The salt flats are really cool - I love how the white floor looks like snow. I love traveling vicariously, particularly when we're trapped in the throes of winter! Point2make - I'm so glad you enjoyed this hub on Death Valley National Park! It is truly an amazingly diverse place with endless opportunity for exploration. Thanks so much for the read and for your comments! Brett Winn - Thanks so much for the complement! I really do love to share my photographs of our beautiful National Parks as it gives me a chance to relive our delightful explorations. So glad you enjoyed the virtual tour of Death Valley! Thanks for visiting! Another great hub Stephanie. I enjoyed the photos and your information on the various choices throughout the park were excellent. Thanks for the info and thanks for another great RV hub. This was magnificent ... I hope you get a Hub of the Day for it! Thank you so much! I also thought that our hubs on Death Valley should be linked as you've shown another perspective. The spring flowers were just starting to bloom when we were there ...I'm jealous that you were there to see the full bloom! Thanks so much for the comments and for sharing! You did a marvelous job with this hub! I'm going to link it to my Death Valley hub. This is SUCH a beautiful and interesting national park and your photos are wonderful. Like you, I took lots of photos. We were there in late May and the flowers were amazing. Voted beautiful and awesome and will share this hub with my followers plus tweet. Our RVing trip to Death Valley National Park was a unique and enjoyable experience, and I loved being able to relive it by sharing my photographs! Thanks so much for your kind comments and votes. Your ongoing support means a lot to me! Stephanie, I always love your RV hubs! This one is now a favorite of mine. I've wanted to visit Death Valley and your photographs are breathtaking and inspirational. Love all the facts and information you've included to supplement your personal experience. Top notch and rated up, up, up! iamaudraleigh - Glad you enjoyed the photographs of Death Valley National Park! Thanks for the read and for your votes! Bob - I think that Death Valley is sometimes passed up in favor of more glamorous National Parks, but we found it to be well worth the visit. While there are no spouting geysers or grand canyons, the carved hills, beautiful colors and amazing vistas make it a great place to explore. Camping in the Death Valley National park is still very reasonable, and, at least when we were there, the park was not overrun with visitors. Glad you enjoyed reading about it. Thanks for your comments! Ladylyell - I'm so glad you enjoyed the photographs of Death Valley National Park. It is truly an amazing place and the changing colors of the mountains and the desert are enough to inspire anyone. Thanks so much for your comments! Great hub, great pics! Voted up! Well presented and resources article with great illustrations. I drove passed that area several times when I lived in the States. I love dry areas and lived in Baja for 5 years, as well as San Diego, etc. Thank you for taking me on a tour of Death Valley as this is as close as I am going to get to a visit. The world is full of wonderful places and by giving an over view plus photos as you have of this special spot all can enjoy. The colors in the mountains are amazing! Tammyswallow - The Grand Canyon is yet another wonder of the U.S. and so different from any other national park. Glad you enjoyed the virtual visit to Death Valley - I'd love to meet you on the road someday! Thanks for stopping in to comment! The Finance Hub - Glad you enjoyed my hub about RV camping in Death Valley. Thanks for the read and the votes! Every time I read one of your hubs and see your photos, I want to partake in the RV life. I really hope to do this in retirement. I have been to the Grand Canyon, but not Death Valley. Gorgeous! Thumbi7 - I'm glad that you enjoyed the photographs of Death Valley. The name is a little frightening, just as the area must have been frightening to the first people to try to cross it. The name was given to the valley by pioneers who became lost and thought they would die there. As they left, the story goes that they said, "Goodbye, Death Valley." Thanks for your question - I will add this bit of trivia to the Hub! Why is it known as death valley?